Indy car driver Danica Patrick has quickly risen to sports marketing superstardom. Now she has to start winning races. 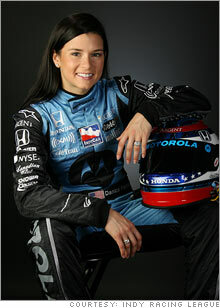 NEW YORK (CNNMoney.com) -- Danica Patrick is set to start her third Indianapolis 500 this Sunday in the third row. But she'll still be far ahead of the other drivers in the race in one important way: marketability. Patrick has appeared on front pages, not just sports pages. She's been in a Super Bowl commercial for GoDaddy.com, as well as spots for Procter & Gamble's (Charts, Fortune 500) Secret deodorant and the Honda (Charts) Civic coupe. Her lead sponsor this year is cell phone maker Motorola (Charts, Fortune 500), a big step up from the subprime mortgage lender Argent that she had her first two years. Danica Patrick has become one of the most appealing athletes of all time in the eyes of consumers, but she'll need to start winning to maintain that appeal to advertisers. A survey of consumers conducted for Los Angeles-based entertainment marketing agency Davie Brown Entertainment found that 47 percent of those surveyed knew who she was. That's not only far above the 3.7 percent who were aware of last year's Indy 500 winner, Sam Hornish, it's above some of the more successful drivers on the far more popular NASCAR circuit, such as Tony Stewart and Michael Waltrip, who are both recognized by about a third of those surveyed. Among race car drivers, only NASCAR's Jeff Gordon and Dale Earnhardt Jr., both with better than 60 percent recognition, are better known than Patrick, and neither of them have her appeal. Davie Brown's celebrity rating index gives her an 80 appeal rating, the fifth best of any athlete it includes in the survey. That not only tops Gordon and Earnhardt, it's slightly better than superstar pitchmen Tiger Woods and Michael Jordan. The Indy Racing League is doing everything it can to cash in on this, having Patrick hit the major morning news shows before the start of its season and featuring her on posters for the sport with many of the circuit's more successful drivers. And that's the rub. Despite leading the Indy 500 for 19 laps her rookie year, Patrick has yet to win a race. She looked into jumping to NASCAR during the off-season before deciding to return to the IRL, although to a new team with deeper pockets. By joining Andretti Green Racing and getting a new car this year, she could have a better chance to move to the next level. If she doesn't, she's at risk of becoming racing's version of Anna Kournikova, the Russian tennis player who has enjoyed more success as a model and commercial pitchwoman than she ever did on the court, where she never won a singles tournament. While Kournikova's appeal in ads lasted longer than her career on the court, it didn't last forever. She makes what seems like a cameo appearance in her only recent television ad for K-Swiss (Charts). Even Patrick says she needs to start winning soon to maintain her appeal to advertisers. "What I always kept in mind, and what I really believe, I just need to win," she said when I asked her whether marketing considerations weighed in her considering a jump to NASCAR. "Wherever I'm at, it will be a big deal when I win, and a lot of other things will materialize and things will happen." Patrick is no longer the only woman on the IRL. This year's race will have three women for the first time - with Sarah Fisher retuning to the circuit and Venezuelan driver Milka Duno joining the circuit. But while they were also getting a lot of media attention during IRL's press junket to New York this week, the two are not expected to compete for the lead the way Patrick might. And they certainly won't be much of a challenge for sponsorship or advertising dollars, either. The split between male and female viewers hasn't changed radically since Patrick burst on the seen two years ago. In 2005, about 34 percent of viewers 18 and older were women, according to Nielsen Sports Marketing compared to 32 percent before that. Last year women were about about 33 percent of viewership. The bigger change was an increase in overall viewership - up about 30 percent in 2005, compared to the most recent race not hit by rain delays in 2003. While the ratings fell by 16 percent last year as Danica-mania died down, the viewership was still about 10 percent above the 2003 rating. That's a solid gain in a sport that has fallen farther and farther behind NASCAR. The IRL is thinking about using the fact that it has three women racing on the circuit as a marketing tool to try to attract more women and young girls, said John Griffin, its vice president of public relations. But a big push won't come until this off-season. Griffin remarked that it's too soon to start criticizing Patrick for not yet winning a race. "I think she still has considerable momentum on her side, especially with the new car, the new team," he said. "We've looked at it, and it takes an average driver 33 or 34 races to win their first race. She just passed that number in the last couple of weeks." While the attention she and the sport have gotten this year has clearly died down since her debut two years ago, racing's leaders are looking forward to the day she wins a race, even if it's not the Indy 500. "The day she wins a race, she'll be page one material again, and Danica-mania will be right back to where it was in '05," Griffin said. But Patrick's numerous advertising partners must be hoping it won't take too much longer for her to take a checkered flag.